Brief Description: Two Little Fishies ReBorn is a coarse aragonite calcium reactor media made up of completely dissolvable fossil skeletons of reef building corals from the Western Pacific. ReBorn is designed to replenish calcium and carbonate alkalinity, strontium as well as trace elements. 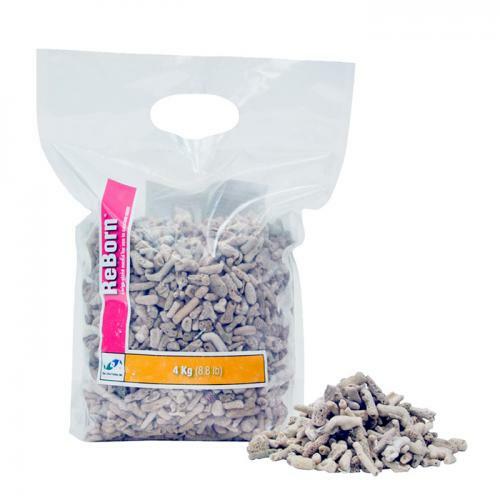 Notify me when "Two Little Fishies ReBorn Calcium Reactor Media [4 kG]" is re-stocked. The coarse size of ReBorn allows for unrestricted water flow and easy diffusion of carbon dioxide, for maximum efficiency and easy maintenance of the calcium reactor. ReBorn dissolves completely and will not turn to mush!